Wonderful Place to Live with Great Staffsubmitted by Christian N. - Mar 30, 2019 |Recommended: Yes909 Flats is by far the best apartment community I have lived in The staff are extremely friendly and the community is well kept. I love that 909 is pet friendly, my dog has made so many friends. 909 is also in a great location It is within walking distance to downtown and local shops and restaurants. Overall, I enjoy being able to call 909 home. I like the property and location.submitted by Paige D. - Mar 01, 2019 |Recommended: YesLiving at 909 has perks and downfalls. The downfalls are the parking gate that closes off the back entrance, the random fire alarms, receiving a noise complaint when I was not the one making noise several times , the bright lights that are on the US Tobacco building, and random motorcycles left in parking spaces for years without being moved. Also, the security guard makes me feel the opposite of safe. The perks Ebonee is very friendly and nice to work with, I like that yoga is offered, I like when the free food is offered, the property is always clean, maintenance requests are answered quickly, parking can be scarce late at night but it is nice having a garage on the floor I live on , and I can rarely hear my neighbors. Love itsubmitted by Mieke F. - Feb 09, 2019 |Recommended: YesI absolutely love living at 909. The apartments are beautiful and the staff is always coordinating fun activities for the residents. For the most part, the apartment is very quiet. I never hear my neighbors that live above and beside me however my apartment faces Rosa L Parks Blvd therefore I hear all the traffic sirens trains. Parking availability on my floor is limited and I often have to park on a different floor. Other than those inconveniences, I would definitely recommend 909 Flats to anyone. response from property - Feb 12, 2019 Hi Mieke! Thank you so much for your positive review and kind words! We are so happy to have you as part of the 909 community. If we can do anything to improve your experience, please don't hesitate to provide feedback. We want to ensure a happy experience for all of our neighbors. Thanks again! Nice place to livesubmitted by Francisco G. - Feb 07, 2019 |Recommended: YesVery nice, new, clean, and fun place to live. Very cozy, the complex is very well taken care of, and its location is so convenient. It’s home.submitted by Brett G. - Jan 30, 2019 |Recommended: YesIt’s convenient to all of Nashville. Exceptional place to live. Staff goes above and beyond to make sure everything is taken care of. One of the best places that I've ever livesubmitted by Daniel H. - Jan 16, 2019 |Recommended: YesI love this apartments, it's so close to my workplace, I love to be so close to everything, Farmers Market , State Park, Downtown, Music Venues, it's an amazing area. It's feels like home. I'm very happy to be part of this community. Close to Everythingsubmitted by Susan R. - Dec 07, 2018 |Recommended: YesComfortable Easy Living. 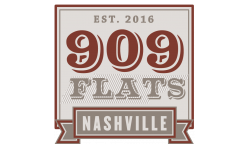 909 Reviewsubmitted by Mary T. - Dec 05, 2018 |Recommended: Yes909 Flats is a great community to live in. I feel safe and right at home when I enter the building. Very good, well-maintained apartments near Downtown, Nashvillesubmitted by Balaji N. - Nov 11, 2018 |Recommended: YesI am living here for 8 months now and like the apartment so much that I would it among the best in Nashville, TN. There are many advantages being here near to downtown if your office is in downtown , right across Farmers Market, etc. Apart from location it very well maintained and special mention to the staff in leasing office and maintenance staff who always go extra mile to meet resident's request. I really appreciate the service. The property is beautiful and kept immaculate.submitted by Harvey K. - Nov 05, 2018 |Recommended: YesLiving here is amazing.I do not have a single complaint. The location is terrific you have everything you need .But the best part about living here is the staff.So courteous friendly and takes care of any need or request right away.The is definitely the best move I ever made. .submitted by Lincoln H. - Oct 25, 2018 |Recommended: Yes. Great amenities location, friendly staff, some noisesubmitted by Devon H. - Oct 02, 2018 |Recommended: YesThe staff at 909 from the front desk to the cleaning maintenance staff are extremely professional, kind, and consistently helpful. The amenities have been extremely useful. I love having access to coffee, a gym, the pool, recreational areas, grills, etc. I also feel like the majority of the finishes in the apartment are high quality and meet my expectations. I do not feel like the building is particularly secure, and I'd like to see the locking mechanisms on the doors upgraded they're very flimsy and don't instill much confidence . I'm fortunate to have pretty quiet neighbors, but I can very clearly hear them doing everyday things talking, walking, etc. . I'd imagine that this would become a problem for me if I lived next to anyone who made any significant amount of noise. Great apartment complex at a reasonable pricesubmitted by Jacob P. - Sep 14, 2018 |Recommended: Yes909 Flats has been great. The location is amazing and the price is on par or better than everything else that I saw. Apartments are spacious and well designed. Neighbors above you can be loud, but that seems like a resident issue rather than a management issue. Great Place to Livesubmitted by Nick R. - May 01, 2018 |Recommended: YesI was one of the first to move in almost a year and 1 2 ago and I have never regretted it. Great staff and location.